… it was on this day, 150 years ago that the Army of Northern Virginia suffered a critical defeat at the Battle of Five Forks, thereby aiding further in the Confederacy’s unraveling. In a quick note on Facebook this morning, I recalled Col. William “Willie” R.J. Pegram receiving a mortal wound on this day (dying on April 2), and how he was one of the finest artillery officers of the Civil War. I also noted the interesting exchange between Pegram and William Gordon McCabe, after Pegram’s wounding and leading up to his death. From Peter Carmichael’s excellent biography of Pegram (Lee’s Young Artillerist: William R.J. Pegram. McCabe and Pegram prayed and exchanged a few words in the ambulance. “Gordon,” said Willy, “I am perfectly resigned, if it is God’s will to take me, but it will be such a blow to them at home.” “My God,” McCabe cried out, “why hast Thou forsaken me!” “Don’t say that, Gordon, it is not right,“ Pegram quickly replied. Bending to kiss his friend “over and over again,” McCabe called Pegram by his given name for the first time: “Oh, Willie, I did not know how much I loved you until now.” “But I did, Gordon, Willy said. I see Kevin Levin also took time to reflect on Pegram (using another excellent quote from Carmichael’s book), though from a different perspective than my own. Kevin reflects more on that which seemed to serve as “drive” within Pegram, and how that “drive” sustained him and his courage on many a battlefield, especially in regard to slaves and the Confederacy. Though Kevin didn’t mention it, I imagine Pegram’s comments (in letters) regarding the use of regiments of U.S. Colored Troops at the Crater probably carry a fair amount of weight in his assessment of Pegram. While Pegram’s position on matters seems clear enough, my focus is on those in the ranks; the complicated status of affairs in their heads; and how they may have reflected on Pegram as a battalion commander… not necessarily on the source of Pegram’s “drive”. Specifically, on this day, I look to two of the many other Confederates present in the battle on this day… Pvt. Joseph Nicholson and Corp. Abraham Strole… both distant uncles (brothers to different sets of my third great grandparents). Strole, it seems, was likely present with Pegram’s guns at Five Forks. Hailing from the Shenandoah Valley and a family (of Germanic descent) that did well for itself, Strole still does not reach the same social strata as Pegram. In fact, outside the unit, they seem worlds apart. Strole enlisted in June 1861 in a small, poorly supplied company of artillery from Page County, and, by the fall of 1862, found himself shuffled in a reorganization of artillery… ending-up in a company commanded by (then) Captain William Pegram. No doubt, Strole had the chance, in many instances, to see Pegram operate as a commander. 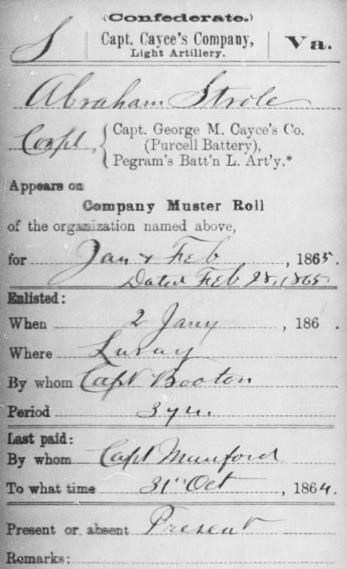 Though Strole went AWOL only once after the transfer to Pegram’s command (Jan – Feb, 1865), he appears to have provided a sufficient excuse upon his return, and was promoted corporal. I often wonder how Abraham Strole looked to Pegram, both as a leader and as a man. Only a year younger than his battery commander, I imagine it may have not been much different than many different men who come together in similar circumstances. Ultimately, the only legacy that we have is that Pegram probably proved himself worthy of respect in various ways… a very good and effective commander (and one who frequently preferred to put his people in the thickest of the fighting). As is so often the case, while we can read about what motivated men like Pegram, we often have to read between the lines for what men like Strole thought. It can only be a wild guess as to whether Strole believed, and whether he would have agreed with Pegram at some level or not. 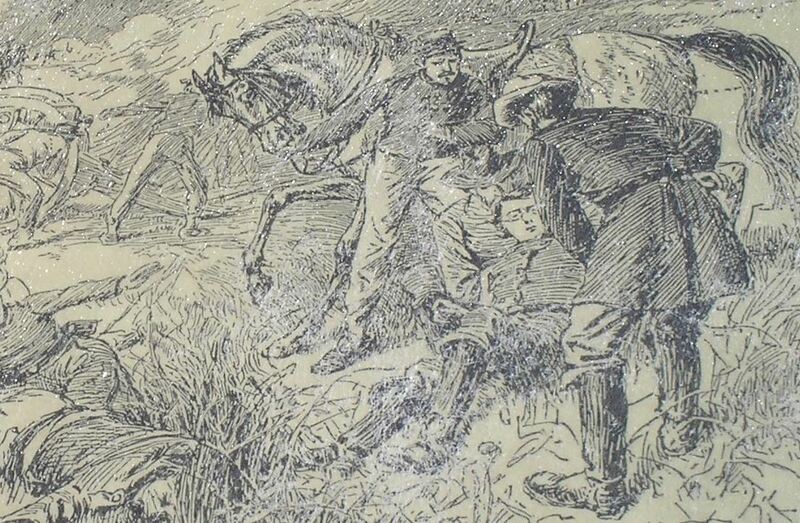 Nonetheless, Strole appears to have remained faithfully (whether to the commander, comrades, cause… or all of the above), to the day on which Pegram was struck down… the same day on which Strole was struck down. Like his battalion commander, he too died on April 2. 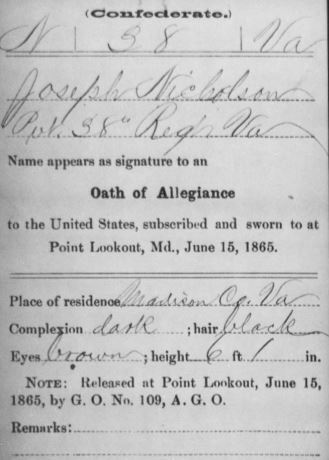 Though not part of Pegram’s command, my attention also turns to Joseph Nicholson… a private in Co. H, 38th Virginia Infantry… one of George Pickett’s men. I know, to some who don’t look too deeply, he might be mislabeled as one of those who were they, “in defiance, to the end”. Such considerations, so shallow, reap measurably equal rewards. Certainly, even among those there to the end, the complexities as to reasons vary. Unlike Strole, Nicholson appears to have evaded Confederate conscription patrols until April 1864, when he was placed in the ranks (and… of course… there’s also the story of Joseph’s brother, Christian, which I highly encourage readers to consider when thinking about Joseph. Incidentally, Joseph’s brother, Vancouver, was also a conscript, serving in the 12th Virginia Cavalry). Though deserting in May, he was later retaken and was present at Five Forks, where he was captured. It seems likely that Nicholson may well have been pleased to see his days with the Confederacy come to an end. As we close in on the end of the Sesquicentennial, I wish more folks could come to this more “nuanced” understanding of the very complex (and not so easily broad-brushed) Confederate soldier… especially those soldiers who were there in the last days, at the “last gasps”. I wish… I wish, but… I know that’s a high order. Update: This post, having been shared on Facebook pages of other blogs, yesterday, generated a comment in Civil War Memory’s share that warrants attention. Specifically, regarding Pegram, a comment was made: “‘Reckless… Careless… Vainglorious…’ from the letters and Civil War diary of Pvt. William Ellis Jones.” I replied that the comment wasn’t actually lost on me when I wrote this post. In fact, as readers can see above, I mentioned that Pegram “frequently preferred to put his people in the thickest of the fighting.”. Whether men stayed because of his “daring” or despite of it, there was more than one way to look at Pegram as a commander, especially from the vantage point of one who fell immediately under his command. I will say that I’ve heard similar comments made of WW2 leaders such as Chesty Puller and George S. Patton. It’s not uncommon to see such a range of comments from men in the ranks. Yet, back to Pegram… if Jones (or even Strole) was one of those who stayed despite Pegram’s “recklessness”, I think this gives us yet another opportunity to consider what made men stay as late as Five Forks. Discussing the “drive” of men in these situations, and with but little from the respective soldiers that tells us exactly what they felt, will keep us discussing this for many years to come. Any death during this conflict is a sad and compelling story…but these occurring so close to the end are somehow all the more poignant. With the record of “Willie’s” last hours so carefully preserved it brings an added sense of loss. Imagine the countless thousands who fell without a murmur or friend to comfort them and leave words of consolation for their loved ones.